Yesterday I shared with you what I had been working on in my studio. One of those things was an “Old Man Face” for a challenge for a FaceBook group I participate in. I didn’t know what I wanted to do with this Old Man yet, so I let him sit (for about a week) and kept staring at him while I worked. Finally I started asking in FaceBook Groups what people thought I should do with him. Overwhelmingly, many people thought he looked rather Asian … that was not my intent, but okay. I decided to run with it! An Asian Old Man Face would almost have to be embedded in some Jade, right? Right. So I hit Google and search for “Jade sculpture” images. I looked through about 500 images until I felt I knew what kinds of techniques, carvings, etc they did with their work. It turns out that sculpting Jade is almost as unique as those that sculpt with polymer. There were hundreds of forms and often many people had their own “version” of traditional jade sculptures. This being said, I decided it was time to try to create my own Faux Jade. Get the bezel I used for this face here. But even though I really like her recipe the best, it needed a little tweaking for what I wanted to do with it. Like Carol suggests in her book, I made two variations and chopped them together, sculpting using the combination of two palettes. For my light version I only used one part green. For the darker version I used 2 parts green. Carol also suggests adding grated black clay into the mix for striations & variations. I preferred the “glisten” that the black glitter gave me. In other words, the recipe you see above is based on Carol’s, but not the same and is only for the darker of the two blends. I encourage you to use the recipe at the left as a base for your faux jade & go from there. Add in more green for more color, white for more opacity & brightness, and perhaps even green glitter for a completely different look! So after making my Faux Jade and combining the two different tones (one light and one dark) it was time to give my old man face a home. I used a stamp to surround the old man’s Jade centerpiece with some definition, very similar to traditional jade sculpture & carvings. I also made faux jade “carved” beads by deeply embossing the outsides before baking. I made little leaves to surround the old man’s face and to hang from the necklace itself. When the beads were finished I baked them at 275 degrees Fahrenheit for 45 minutes. When they were completely cooled I antiqued them with a dark brown paint. Once they were dry, I added a matte gloss varnish and strung them on 1mm brown cording to resemble the “nature influence” that I wanted my piece to add. I also used 6mm creme colored wooded beads for additional accents. The necklace is adjustable using two pull knots. This necklace was made & entered for a “Face Challenge” with B’Sue Boutiques & Christi Friesen. As is the case very often, I had faux jade scraps left over. Not enough to make a Parker and certainly not enough of substance to do anything with … or was there? Of course there was! Not letting one bit of my scrap go to waste, I created this adorable sleeping Jade Dragon to keep & wear as a necklace for myself. There … now I am completely satisfied. What kinds of things would you make with today’s color recipe? Feel free to post your creations on my Facebook page and show everyone what you have made with the color recipe from today’s blog post. Also, feel free to tweet your picture to @katersacres with the #KatersCP to show off your creation! 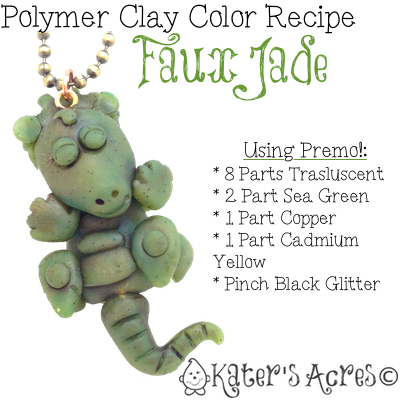 I hope today’s polymer clay color recipe will help you get back into your studio this weekend! Thanks for joining me today and don’t forget to sign up for more tutorials, prompts, and projects direct to your email. Since Sea Green is no longer available to use for fax jade, what color do you recommend as a substitute? In your Faux Jade tutorial, you indicate –“I encourage you to use the recipe at the left as a base for your faux jade” I didn’t see any recipe. Where should I look? Love what you did with the face. Never would have thought to do a necklace. But I especially love the sleeping dragon. Adorable! Thanks Leah! He’s just a baby dragon and they sleep a lot … at least in my mind they do.